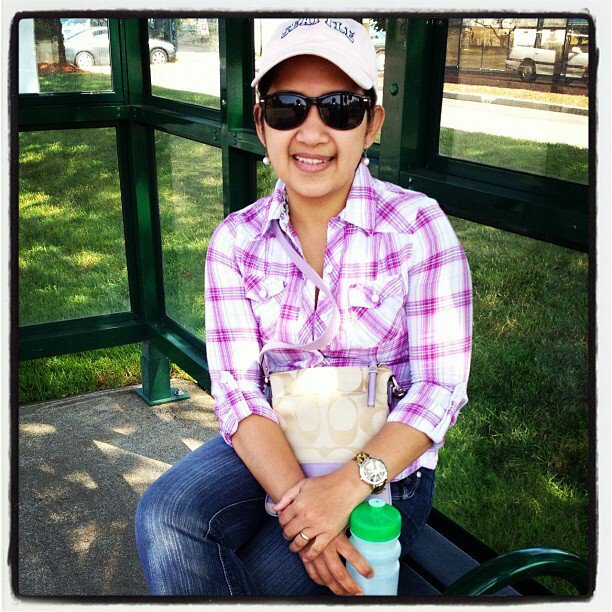 This past few days was really sunny and walking or driving really requires eye protection from the glare of the sun. My husband's eye wear got broken and when we passed by one of the department stores in town, he asked me to go in and get him a pair of men's sunglasses. I bought the one that I saw which was very cheap and was also on sale. When we got home I asked him if he wants me to check online for a good and durable quality sunglasses because I don't want to always buy because we get the cheapest kind. As what the saying goes, you get what you paid for. He likes the Rayban type sunglasses. I like it too especially the ones for men because it shows its masculinity but also very subtle looking. I saw cheap rayban glasses, and the wayfarer is the type I like him to have. I am not sure if she will like it though. He prefers a smaller type. 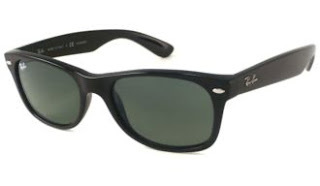 He didn't see this yet but I think he will like it since it is durable and according to reviews it is lightweight, has good polarization, with adequate tint, and comfortable to wear. Those are what he is looking for in an eye wear. We are dealing with a not so hot temperature but enough for the plants to really dry up and starts to wither. This weekend we were trying to patch up some of the dead portion of the grass in our backyard. Actually since last week I have been watering the front yard and back yard almost everyday. The backyard have the portion where the grass really died. When I and our oldest daughter went to the princess tea party yesterday, hubby and our little girl was left at home. He decided to mow the yard and then went to Home Depot to buy top soil and Scotts turf builder eZseed. When we got home, I helped him dug the dead part out and replaced with new topsoil and applied the seeds. I hope it will grow soon and the grass will turn back to green instead of yellowish brown color. This morning after my morning walk with the girls, I decided to water again the front yard. I haven't watered it yesterday. Later this afternoon I will water the backyard again and start doing the flower bed that I have started this spring. My laziness got me and now it's just sitting at the back waiting to be tendered. Summer is very costly for our water bill, but we have to take care of the plants so it will bloom and prevent them from dying. Sadly, I wasn't able to see the whole opening ceremony of the 2012 Summer Olympics that is now being held in London. I saw few parts of it as it was mentioned on the news and some are posted here online. I've seen one news article that the Queen of England is also very sport and even did a part during the ceremony. It was shown on the news how James Bond went inside the Queen's office in the palace and then they came out of the room and hopped on the helicopter. Then they reappeared and both jumped off the helicopter on a parachute to the Olympic Stadium. Of course the other person that jumped off is a double and not the Queen herself. I saw the Queen was being focused on TV and sat on one of the press boxes inside the stadium along with the other dignitaries. Some people commented that nothing can't beat the opening of the Beijing Olympics in 2008. I would say, even though I haven't seen the whole part of this opening ceremony that they have distinct presentation and both countries really did their best to have a grand opening ceremonies. The director, Danny Boyle, made the opening more cinematic. According to some, the opening was boring and more of a political showcasing and that Beijing showed more showmanship and of very high standard. To those who have watched it, what can you say about the opening ceremony yesterday at the 2012 Olympics in London? I can't say much about it since I didn't see the whole ceremony. What I can say is that the Beijing Olympics really set a high standard for opening and closing ceremonies of the Olympics. Their presentations were really jaw-dropping. I hope I can find a link or maybe NBC will have a replay of yesterday's opening. We Need Another Play Center! During summer last year we bought waterslide. The first one was My Sunshine Windmill Bowl Spray Play Center [in picture below] from Walmart. 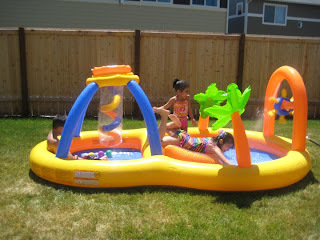 We used it during the 4th of July and some days when it was hot and the kids love to play at the backyard. After few times of using it, it won't inflate anymore. I think it was punctured when I was trying to move it around. We tried taping the hole, but it was useless. Hubby decided to throw it away. Then when the temperature was really hot in mid summer, we bought another one and it's the My Sunshine Hippo and Coco Fun Play Center [in picture below] still from the same store. I told hubby to make sure we are not pushing it around to prevent from puncturing it too like the first one. When the temperature became colder, we kept it. My husband put it inside the cooler. This past spring, during our girls birthdays, we used the cooler. Hubby is the type of person that don't like messy surroundings, he decided to throw it away. According to him there's no place to put it. Since it was crumpled inside the cooler it appears unclean. I wasn't aware that he threw it until I asked him where he put the play center. 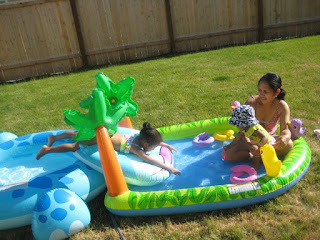 Now that summer is here and the girls love to play outside, we don't have play center or waterslide anymore. Hubby made a trip to Wally world the other day to check if they have similar available but to no avail. I wish he should have kept the second one so we will not buy anymore. But it's too late. 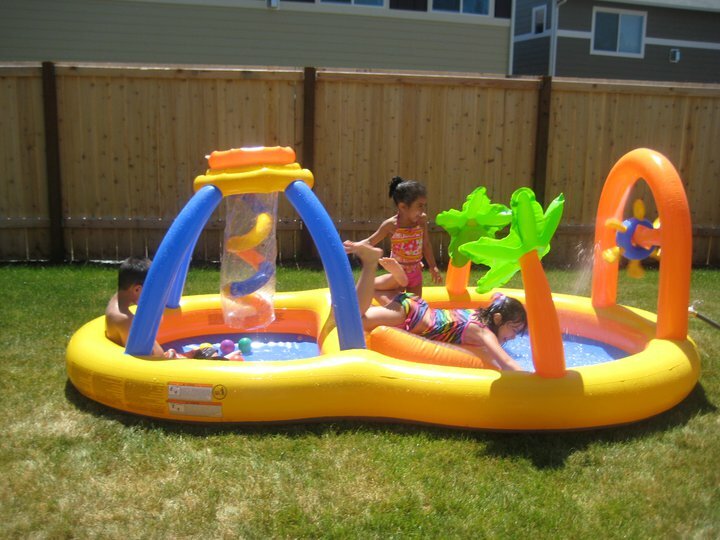 I'll be forced to get one so our girls can at least enjoy our backyard before summer ends. Linking this to 366 BPC! Our little fashionista girl is sporting Mommy's free sunglasses from Firmoo. Yes, she's asking for mines even though she has her pink Barbie sunglasses. I think she wants to copy Mommy. Here in this picture she's wearing pants, but now we will have a lengthy discussion and compromising before she will wear one. She wants to wear dress all the time. Even going to sleep she will not wear his pajamas if it is not the night gown type. She won't even wear shorts or skirts. She just want dress. 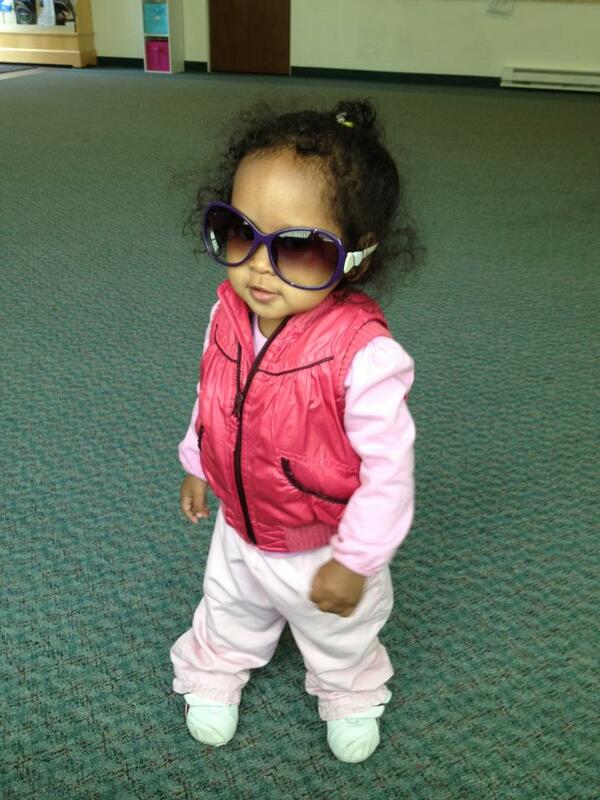 Anyways, I thought she is just so cute in this picture with the big Firmoo sunglasses on. I got this purple with white glasses and I love it a lot. It fits perfectly and very nice looking too. I love purple that is why I chose this style. I got this sunglasses for free and so thankful to have the opportunity to test out this product. Firmoo have different sunglasses as well prescription eyeglasses to choose from. They're fast and booming global online eyeglasses store. And if you need anything, protection for the eyes during this summer or getting your prescription eyeglasses, check them out now. I and a friend decided to go a bus ride last Friday. I haven't tried riding a bus here in our place ever since we moved from the east coast. Back in Georgia I rode a bus when I went to my CNA class early in the morning from my husband's workplace. Honestly, if the buses here have a schedule ever so often I most definitely will ride a bus from time to time. The only thing I don't like is the bus stop near our place. It is on the other side of the road. The highway is very busy with 50mph and no pedestrian lane. The pedestrian lane is about 300 ft at the round about. Anyways, the bus ride was fun, very easy too. The bus fare is $2, which is an all-day pass. You just have to keep it for later usage. I think it is really worth it. If one is working and there is a bus line in the area that also matches the schedule at work, I'd prefer to ride a bus than drive considering the high price of gas. I asked my friend to snap a picture of me while we were waiting for a bus home. I said here before that I started going to the gym to work out. When I first did exercise, it was yoga, I did not feel pain much at all. Yesterday I went with my husband to their family physical training and did the obstacle run, now my arms and legs are sore. I thought I will need a knee walker to just roll about and not use my lower leg at all for the time being. I am thinking I pulled some muscles. Not only that I feel the pain in my lower extremities, but I can feel more pain as well in my arms and shoulders. I did not do any exercise today. We just went for a short walk around our neighborhood then brought the kids to the park. 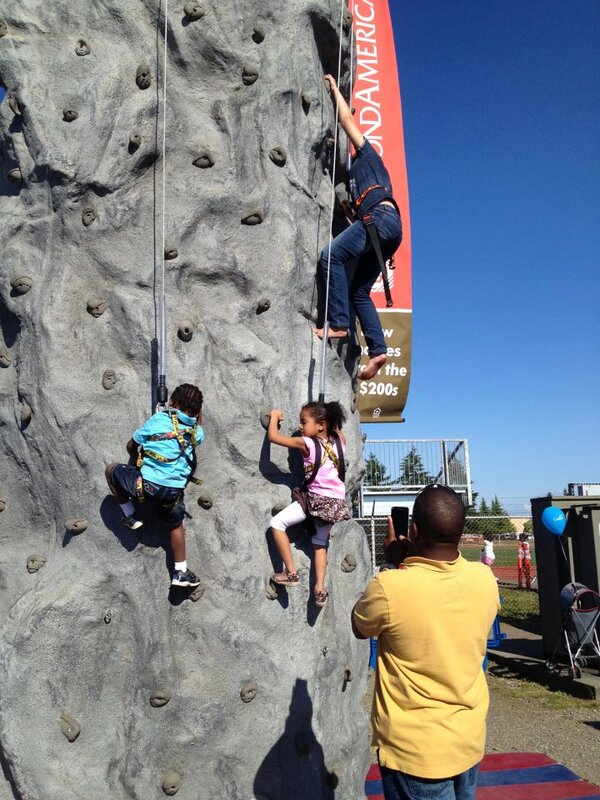 I tried climbing on the short rock/wall climbing thing. My arms are still sore but I think I need to do another upper and lower body exercise tomorrow at least I can work out my muscles again and it will be better. I forgot to take medicine for muscle pain and I run out of it. Hoping to buy ibuprofen tomorrow or alleve so I can take it and lessen my muscle pains. Yes, I hate to see my first car go, but it is time to let go of it as fixing what was wrong will be costly. Back in May my car broke down while we were 46 miles away from our home. Hubby did not fix it yet because he went away for a month-long training. When he got back end of June, he started fixing it. He replaced some parts like the spark plugs and exhaust manifold, and also drain the transmission oil and replaced it as well. Yesterday everything was put together and test drive it. The vibration sound is still present and there is smoke coming out from the engine. Hubby said the oil is burning and he just replaced everything so it will take time then the smoke goes away. Early this morning he tried running it but a white smoke comes out from the exhaust. He suspected it might be one of the pistons. He tested the compression and one on the far right do not register pressure reading. The other three registered of up to 180 in 3 revolutions. Now that he knew the culprit, he said he don't want to fix it because it will cost him more. He has to take out the entire engine and get all the needed tools. He don't like bringing it to the shop because it will cost us an arm and a leg for labor alone. What more adding the parts to buy. He did it before with his old vehicle and he knows what it takes if he starts to do it. Now our option is to trade it and get another vehicle. I wish the car waited until next year to break down, but I the situation is here already, we need to deal with it. I dread the vehicle payment. That car is already paid off two years ago and now once we get another we will start monthly vehicle payment again. It is sad to note but it is our reality right now. I am very happy that if ever it will be pushed through a friend of mine will be here back again in the evergreen state. Her husband will be deployed overseas, and her and the kids will be staying here in the US. She planned of staying here in the US until next year when the school year ended. After that, they are going to the Philippines and stay there until her husband gets back here. I offered for them to stay with us and we are both excited about it. If everything goes well as planned, They are going to use one of the bedrooms. I will just make some rearranging. Hopefully get a computer cabinet for the room they will be using so they can be comfortable to chat or talk to her husband online. I cannot wait and I know the kids will enjoy it as well with another playmates. I have not tried riding a horse or a pony ever in my entire life. Although I rode at the back of a water buffalo before or what we call carabao in the Philippines. Whenever our little girls have the opportunity to ride a pony and they like to, we let them. I want them to experience what I have not experience before. On July 4th, there was a Family Fest on post. 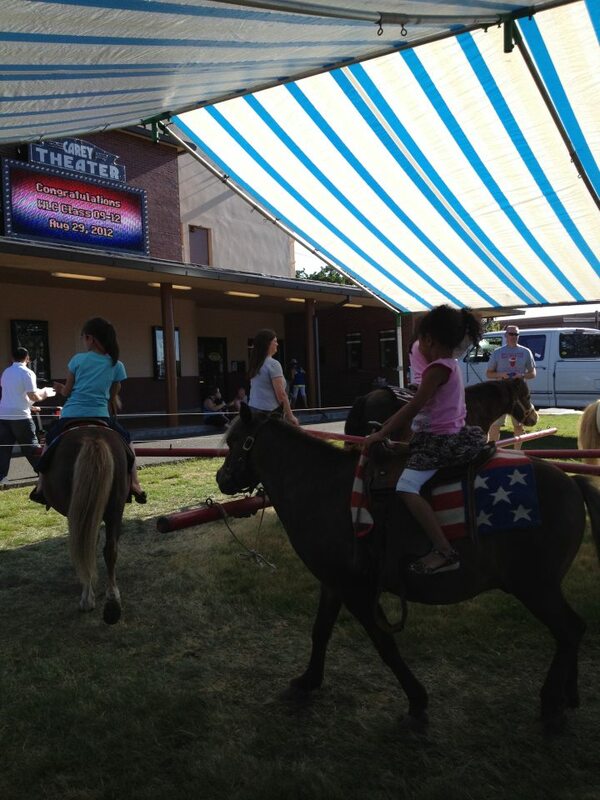 There is pony ride for $5 per child. Our older daughter was very excited to ride and so we let her. She can become a future equestrian. She was not scared at all. She even wave at me every time she will pass by our side. She also moves to the music background while they were on that pony ride. A natural horse rider. I am very proud of her. Ingenuity of people is really very amazing. I am not sure if there is only one person behind this or many of them, but it is surely very entertaining. During the Family Fest on July 4th, one of the displays where people can enjoy is this musical instrument made of anything, from plastics to scraps. 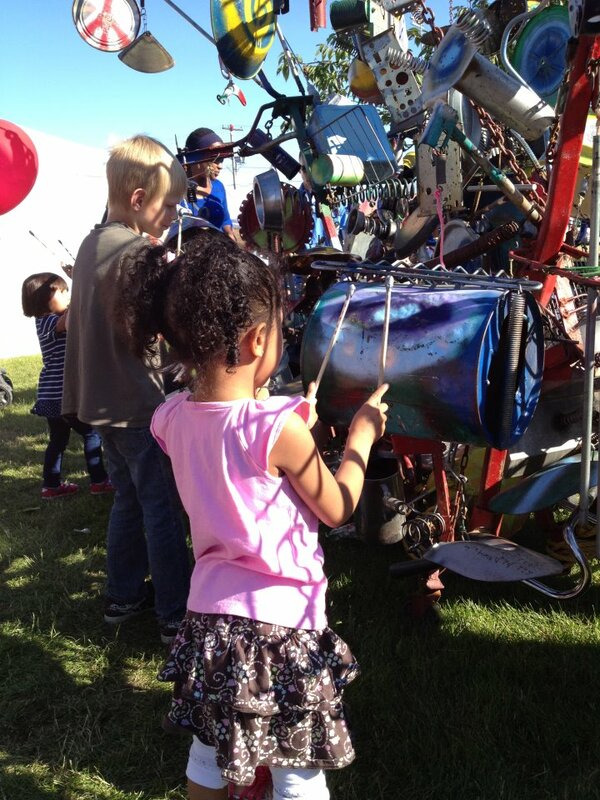 I've seen pots and pans, old bicycles, drums, buckets, forks, spoons, shovel, etc, that were welded together and became a huge musical instrument. They also have drum sticks provided so the spectator can use. Anybody can pass by and make your own music. You can bang, tap it to your hearts content. The kids that surrounds it were so amazed of the music they create. Our two girls were no exception. They enjoyed it a lot. Have you heard about a Roll-A-Bout knee walker? I think this is a best mobility option for those have lower leg surgery or injury and needs a walker. I saw a hospital employee using something like this in the hospital. She was bringing papers to and from different clinics and offices. Some likes the traditional crutches, but this roll about knee walker looks easy and comfortable to use. I really thought that nowadays nothing can stop you from doing your job if you just came from lower leg surgery and you are back to work or you have injury on that part. Your mobility will not be limited, and it still give you the independence until you can get back on your feet again. Another thing to like about this walker is the basket where you can place whatever you need to bring and free your hands. I thought our DD1 will chicken out on all the rides on post during the Family Fest on July 4th. 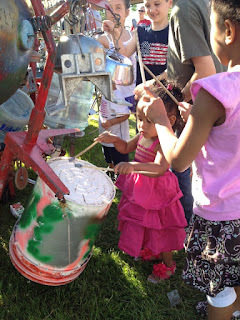 There were lots of rides and fun games as well as live concert for all to enjoy. She was so eager to try all the rides. One thing that she was whining while we were having our snack of apple supreme funnel cake was to try rock/wall climbing. I told her we will just go to bounce houses and slide rather than try it. I thought she is not allowed. Then hubby brought her in to try just so she will stop whining about it. She tried it although she did not really went up high but at least she had the taste of it. I know she was kind of hesitant when she was already put on the harness. She also did not wear the proper shoes for climbing so it made it more difficult for her to grasp. I guess it's an experience for her. She said she will try wall climbing again like this high when she's a little bigger. I am really frustrated with my hair because I have been trying different shampoo and conditioner and nothing really works with my dry hair and scalp. Conditioner is what I use after every shampoo, and I think most of us does that too. The thing is, even with leave on conditioner I can't seem to get that softness and shine that I am looking for. Another problem I have right now is over dry scalp. Like, really, it is very embarrassing to have white flakes on my hair even after I just finish washing my hair. I used different dandruff shampoos but still to no avail. Somebody told me to try organic conditioner or treatment shampoo. I tried some but still the problem persist. 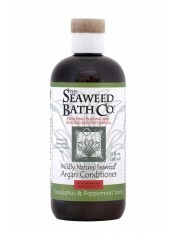 Maybe I have to try this natural seaweed shampoo and conditioner maybe this will work in my type of scalp and hair. We went to Burlington Coat Factory yesterday because I was thinking of getting some inspirations for decorations in the house. I looked for vases, jars, storage boxes, curtains and more in the home section. Instead, I found novelty boxes that is perfect for storage in the office, closet or even in shelves in the family area. I bought these two novelty boxes above in different sizes. Got the large and medium sizes. I did not see the small size so I settled for the two. This is perfect to store our DD1's output from school as well as her portfolios. She got two, from last year and this year. I can store it in safe box and she can look at it when she grows old. I am pretty sure she will be amused of her art work. These boxes will look good to store inside the closet. I am planing of getting some more to replace the small moving boxes we have lined up on our top shelf inside the closet. Having a decorative boxes can make it more appealing to the eyes and minimize the clutter as well. This post brought to you by Atlantic Luggage. All opinions are 100% mine. Another free vacation opportunity is now going on through Atlantic Luggage and Legoland Sweepstakes. This sweepstakes includes the prize of winning a 2-day vacation for two adults and two children to Legoland in Florida. It includes 2 nights of hotel accommodation; car voucher; meet and greet with a LEGOLAND master model builder; and a free set of Atlantic luggage. The sponosor of this sweepstakes, Atlantic Luggage, offers an affordable, lightweight, and perfect for families to-go luggages. It is very important to have a durable and lightweight luggage to stand the test of time and harsh condition of traveling. This is one of my wishlist as to luggages because I know how stressful it is to travel with kids and bringing heavy luggages. If you want to win the prize, enter now to grab the chance. The kids will surely love the new water park in Legoland Florida that was recently opened in May of this year. The wave pool, tube slides, and body slides is absolutely a fun to do for the family. There is also a way were you can create and design a unique LEGO vessel to float on their 1,000 ft lazy river. Kids and adult alike will surely enjoy it. If you haven't enter yet, check it out now and make your summer exciting if you win this Legoland vacation brought by Atlantic Luggage.